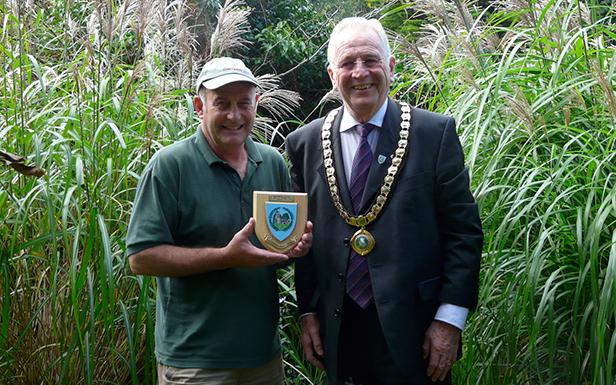 The Mayor of Ferndown, Cllr John Lewis has presented a plaque to Neil Lucas, the owner of Knoll Gardens, in recognition of the help he has provided to the Town Council over many years. Cllr Lewis made the presentation during his civic day visit to the show gardens, in the company of nearly 30 dignitaries from across Dorset. During a tour of the four-acre show gardens, the visiting party admired the stunning autumn colour, marvelled at the ‘champion’ eucalyptus tree, and learned a little of Neil’s low impact style of gardening. Best-selling author and member of the RHS Council, Neil also holds 10 consecutive Chelsea Gold Medals. His gardens are open Tuesday to Saturday, 10am – 4pm.